Shortly before my 77th birthday, I treated the Tested Technology office (and therefore myself) to an electric recliner. But my dream of spending my declining years, er, reclining, was shattered by an email offer from the US company Varidesk Inc of one of their front-line products to install, test out and, if I so chose, retain for permanent use. Varidesk’s timing was uncanny. Within a few days of luxuriating in the pushbutton-controlled comfort of my leather-upholstered Juniper Wall-Hugger (so-called because it slides forward as it reclines, so doesn’t have to be positioned well away from the wall), I had begun to see the potential health hazard of this honey-trap. Yes, I could work very conveniently sitting up with my Macbook Air on my lap and then segue smoothly backwards into a fully supine napping position. Halfway between these two configurations would put me in the perfect posture for relaxed but wakeful viewing of movies on the office Viewsonic projector. Apart from the rather frequent forays down the corridor to the bathroom common to most gentlemen of my years, the Juniper Wall-Hugger could so easily become my sole place of residence. And eventually my final resting place. We needn’t wonder why so many recliners turn up in Charity Shops. So, the Varidesk ProPlus 36 standing desk to the rescue. THIS ITEM IS HEAVY and the packaging comes with the warning that it’s a two-man lift. Getting it upstairs to the Tested Technology office single-handed gave me my first taste of its calorie-burning talents. The thing is built to take a maximum weight of 15.88Kg, with a broad base for keyboard, mouse and other oddments and an upper deck to house a maximum of two flat-screen monitors. The packaging carries a “Fragile” warning. This must be a description of how you’re going to feel after carrying it up the stairs. In every way, this is a very rugged piece of kit. The stairs to the Tested Technology office were, according to Varidesk’s literature, only the beginning of my calorie-burning adventure. Apparently, if I spend four hours a day working at my ProPlus36 in a standing position, after five days I’ll have burnt an extra 640 calories. A loss of 640 calories for every working week. The male model in the associated illustration (see below*) certainly looks very trim about the midriff. More about these alleged health and other benefits later. In fact, the two-tiered ProPlus 36, isn’t just a standing desk. 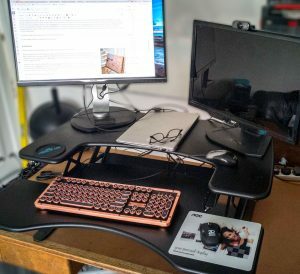 When you need to take the weight off your feet but still carry on working, a simple two-handed squeeze on each side of the desk folds the whole contraption, smoothly counterbalanced by powerful springs, down to height zero. This puts your keyboard, mouse and monitor at regular desk level for a sitting session. Next time you feel like being upstanding, simply kick your chair away and reverse the two-handed squeeze process. The springs on either side help lift the two-tiered structure with a gentle, forward-curving motion. It’s so effortless that if you take your hands off the keyboard for a couple of seconds you can do it in mid-sentence. (I just did). “Smoothly counterbalanced”, I said. How smoothly? With the kit come several handy accessories, including a set of velcro-style ties for cable management and a circular silicone mat evidently designed to take a cup of coffee. This seemed to suggest the ideal test of the smooth lifting. 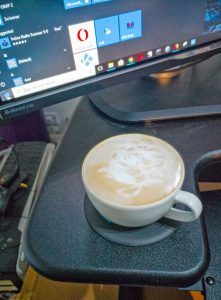 Starting at height zero with a coffee cup filled to the brim on the upper, monitor level, I grasped the two side handles, squeezing them outwards to release the latches. The counterbalancing springs allowed me to raise the desk to my ideal standing position. Releasing the side handles locks the desk into its new position with a modest clunk. The round silicone mat has a slight rim, apparently designed to catch small spills. There were no spills. Not a drop of the beverage escaped the cup. In fairness, I should say that if you load the Varidesk ProPlus 36 with the maximum of two monitors it has been designed to take, the height changing is noticeably less smooth. Still entirely practical, but I didn’t feel confident to repeat the coffee spill experiment with a two monitor load. The ergonomics of a computer workstation also involve the positioning of the monitor and the touch response of the keyboard. The Varidesk monitor platform is a fixed distance above the keyboard base, so you’ll have to rely on adjustments inherent in the monitor stand to make its positioning optimal. The monitor in the picture is the Philips 258B6QEB which Tested Technology reviewed a year ago, and its rise, tilt and swivel largely fit the bill, although when positioned on the Varidesk I would have liked the option of a little more height than the maximum the stand allowed. The keyboard in the picture is rather special. It’s the AZIO Retro Classic, a backlit USB device inspired by early typewriters. The mechanical keys clack like the old Remington upright they resemble and may not be to your taste if you like a nice quiet office or have become used to the near-silent scissor- or dome-switch keyboards of today’s notebooks. But to an old hand like me, having written my first professional offerings on a typewriter, graduating to computers in 1980, when the much respected Cherry mechanical-switch keyboards dominated the market, the AZIO is more than just a trip down memory lane. The very solid touch and fast response hold out the promise that these AZIOs may take us back to the reliability and endurance we came to expect from those old Cherrys. Time will tell. There’s no room here for more about the AZIO, an import from the States with a US keyboard, but I’m hoping when the Bluetooth UK version arrives (soon, I’m told) to give you a complete review. If lifting and lowering the desk manually sounds too onerous (it actually isn’t) Varidesk also offers a motorised version, the Pro Plus 36 Electric, for an extra $100. It’s physically identical to the Pro Plus 26, but takes you from sitting to standing at the touch of a button. With it comes a PowerHub that includes three AC outlets and two USB charging ports. This, I suppose, is what I really need to match my powered Juniper Wall-Hugger. Work in a standing position isn’t just about losing weight. According to Varidesk, it will also help to lower blood pressure and protect against heart disease and diabetes by keeping down blood sugar and cholesterol. A couple of years ago, a study by the Texas A&M University showed that call-centre workers using sit-stand desks like the ProPlus36 were 46% more productive than those using conventional sitting desks. This productivity study is cited in Varidesk’s brochures. but its validity has been questioned. More recently, there have also been question marks around Varidesk’s assertion of the health benefits. Research at the Curtin University in Australia concluded that desk work in a standing position increases discomfort significantly in the lower back and lower limb regions. Standing marginally improved creative decision making, the research found, but after working in this mode for approximately an hour and a half mental reactiveness measurably slowed down. Notwithstanding (as you might say) there seems to be little question about the health hazards of too much sitting around. Studies seem to suggest that a better antidote to sitting isn’t necessarily standing—it’s walking. So standing up, it seems, has its downsides. 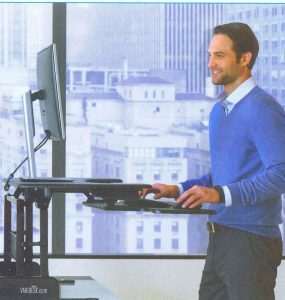 But at least sit-stand desks like the Varidesk give you the option. And if during standing sessions, rather than remaining dutifully at attention, you take the opportunity to stroll about the room from time to time (something sitting comfortably doesn’t seem to encourage) you may avoid the health hazards and reap the health benefits. Movement, apparently, is the key. Productivity benefits, if they are a reality, are probably best regarded as a possible cherry on the cake. I can only say that standing at this desk writing this piece certainly has been especially productive for me. But that could well just be its novelty value. I’ll be able to say more as the months wear on. And hope to do so. 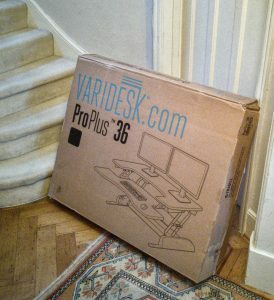 You can order the ProPlus 36 direct from the Varidesk Web site or from Amazon. Either way, it’s £365 including free delivery, with a 30-day trial period. At the end of that time, if you’re not happy with it, Varidesk will give you your money back and collect the desk at no extra charge.